Hi there! I’m Aliza and I am visiting today from Home Crafts by Ali. It’s great to be with you here at A Sparkle of Genius. I like it when I can mix my love of crafting with finding good deals. This cheerful Birdhouse Craft was the perfect project for that. If you buy a lot of craft supplies, you know that it can definitely add up. Look for deals in the clearance section of craft stores, craft supplies at thrift stores or yard sales, or even things around your house that you can re-purpose. I was recently at the thrift store and found a little wood birdhouse. It is definitely too small to use as a real birdhouse, but it is the perfect size for a little decoration. I bought this birdhouse for .50 at the thrift store. If you buy them at the craft store they are just $1.50, so I didn’t save a ton, but every little bit helps. 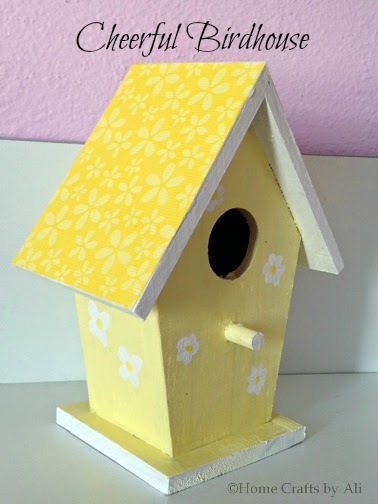 I decided to decorate this birdhouse in a yellow color. I wanted it to be light, bright, sunny and cheerful. First I painted the main part of the birdhouse with the lemon chiffon color. It is a very light yellow. It took two layers of paint to get the color I wanted. Then I painted the roof and edges of the birdhouse with the white paint. I wanted this to be a clean divider between the yellow of the birdhouse and the yellow of the paper I use on the roof. To give the birdhouse an extra bit of color, I wanted to use a yellow paper with white flowers. I thought it would be a nice addition to the roof of the birdhouse. I put the roof of the birdhouse down on the wrong side of the paper and traced it. Then I used my paper trimmer to cut the scrapbook paper to the size I needed. I ended up with these two pieces of paper, one for each side of the roof. Next I applied my Mod Podge craft glue to the back of the paper. I also put a small amount on the roof of the birdhouse around the edges. It is a little hard to get the right amount of Mod Podge to the very edge of the paper, so I added that bit to the roof to make sure it would stick firmly. After I put the scrapbook paper on the roof, I used a light sand paper to sand the edges of the birdhouse roof where a small amount of the scrapbook paper hung over the edge. That just makes it flush and looks a little nicer. Next I decided that the birdhouse was a little plain with just the yellow on the main part of the birdhouse. I painted a few little white flowers on the sides and the front to add a bit of decoration. I made this decorative birdhouse as a gift, and didn’t know where the person would be using it, so I decided to put a layer of Outdoor Mod Podge over the whole birdhouse. If they decide to use the birdhouse on their porch, it won’t get ruined by the weather. Here’s the finished project! I like how cheerful it turned out. Thanks for checking out my Cheerful Birdhouse Craft.